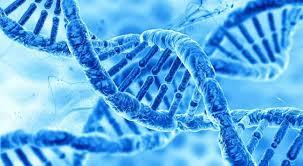 Genetic Testing is the FUTURE of care in the diagnostic workup of thyroid nodules. Thyroid nodules are very common and most thyroid nodules DO NOT need surgery for a diagnosis. This is because most thyroid nodules are not cancerous. We have several tools we can use to decide which nodules need surgery and which ones don’t. Ultrasound and needle biopsies are very helpful in the majority of cases to help us make treatment decisions. Lateral view of neck showing thyroid with nodule. 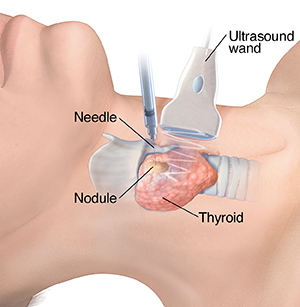 Ultrasound probe on neck and biopsy needle in nodule. However, many times ultrasound and FNA biopsy are not enough. Even the most experienced pathologist will end up labeling some nodules as “indeterminate” or with “suspicious features”. Historically, this is where many surgeons would take the patient to surgery for removal of the thyroid lobe in case it was a cancer. Half of these patients DO NOT need surgery! This is where Genetic testing is changing the future for our patients. Some patients who in the past may have gone straight to surgery can now avoid an operation by having genetic testing of their nodule. During the initial visit in the office, if a biopsy is recommended and performed, we at Austin Thyroid Surgeons will reserve a part of the sample for genetic analysis. The pathologist reviews the cells under the microscope and if any abnormal or “indeterminate” cells are seen they will be sent for gene testing. Over half of these patients will ultimately have genetic tests that reclassify them as “benign”, and they can be safely followed without surgery.